Comparison shopping engines are a great way to market and generate sales for your online store. If you are unfamiliar with comparison shopping engines(CSE), CSE’s are sites that aggregate product listings, prices and product descriptions from a large number of merchants in order to help shoppers make informed buying decisions. Chances are, you’ve already used comparison shopping sites in the past and just didn’t realize it. For example when I do a product search on Google, I’m often presented with a bunch of vendors all at once in order to find the lowest price. And whenever I click on one of the listings, I’m taken directly to the shop owner’s website where he/she pays the CSE a cost per click for the referral of my business. These types of advertisements are also called product listing ads or PLAs for short. Anyway, a comparison shopping engine allows a shopper to compare the prices and products from a large number of vendors in order to help them shop more efficiently. And guess what? Comparison shopping engines are an excellent place to market your goods to new customers. If your products meet any of the following criteria, using CSEs or Product Listing Ads can be extremely profitable. Your value proposition is well expressed – If you can adequately convey the value add for your products, your conversion rate will be high on the CSEs. You have awesome photos – The photos you use on a CSE are crucial in attracting customers to click on your items. Even if you are unsure if your products meet the following criteria, you should still give the comparison shopping engines a try. If they end up being profitable, then great. Otherwise, you can stop using them at anytime. How Do Comparison Shopping Engines Work? The reason why CSEs are so awesome is because the conversion rates tend to be much higher than other forms of marketing. For example, last month my conversion rate for Google Shopping was over 30% higher than my conversion rate with Google Adwords. Why do CSEs tend to perform better than other pay per click services? It’s because all the prices, photos and product descriptions are presented to a customer BEFORE they click on the ad. As a result, when a customer clicks on the link that leads to your shop, there’s a very high probability that they are interested in your product and they want to buy. In this article, I will go over some best practices when listing your products on the Comparison Shopping Engines. Then I will provide you with an in depth review of the most popular shopping sites based on data from my own online store. Enjoy! Note: There used to be many more comparison engines out there but they have since died out or consolidated. For example, Shopzilla, PriceGrabber, Bizrate and Become.com are now owned by a company called Connexity. TheFind.com and Pronto have pretty much disappeared. Almost all of the comparison shopping engines work in a similar way. You need to generate a data feed, which is a file that contains all of your products, images, descriptions, prices etc… in a single document. Most popular shopping carts can generate this for you automatically. For example, Big Commerce, Shopify, and Open Cart all have facilities to generate product feeds for the more popular CSEs. This feed file is then transmitted to the comparison engine in one of 2 ways. One, you can FTP the file directly. Or, you can place the file on your server and have the CSE grab it at set intervals. Once you have your product feed setup, your goods will be displayed online and you will pay a fee whenever someone clicks on a product. Usually the fee varies depending on the type of product and how much you are willing to bid on a particular set of goods. Does this sound pretty straightforward? On the surface it’s simple but as with everything in life, it’s easy to make mistakes if you don’t know what you are doing. Here’s a list of best practices that I’ve amassed over the years while using these services. Not listing sold out products may sound like common sense but it’s not and I’ll tell you why. Most shopping carts offer plugins or special code that will automatically generate the product feed for you. However depending on what cart you use, the automatically generated feed might include items that are either sold out or have very low quantities left in stock. You really need to check. For example, the default product feed for my shopping cart displays goods that are active but might be completely sold out. As a result, it’s like throwing money in the garbage can when someone clicks on a link to your shop and you can’t complete the sale. In addition because the shopping feeds may not be updated very often (sometimes as long as once a month), it’s important to only list goods where you have a significant quantity on hand that is unlikely to sell out. As people start clicking on links from the comparison shopping engines to your online store, it’s important to track where these customers are coming from. By default, Google Analytics already tags incoming links with a referral source. However, certain CSEs may list your products on many sites and the clicks can be coming from all over the place. For example, Shopzilla has at least 3 other partner sites and sometimes it’s hard to tell which CSE is responsible for the click. The only way to definitively tell where a click originates from is to specifically tag the link. In order to tag your links for Google Analytics, I recommend using the Google URL builder. 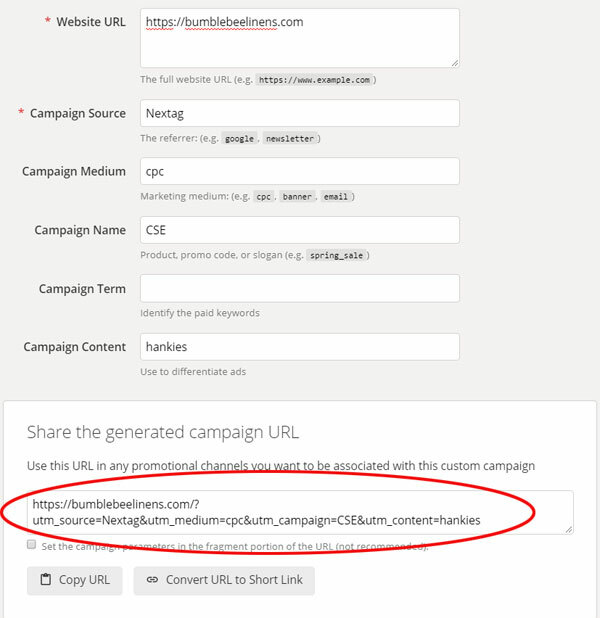 By entering in the parameters displayed above, Google’s URL builder will generate a unique URL with tagging info so you know exactly where your clicks are coming from. Once you’ve tagged your links, your analytics reports will clearly indicate the source of CSE traffic. The other reason to tag all of your links is to make sure that your click reports line up with what you are getting charged by the CSE. If the clicks that you are paying for don’t match your analytics reports, that means that the CSE might be charging you for fraudulent clicks. While you might think this is rare, it’s actually happened to me several times already with well known CSEs. Needless to say, you have to stay on top of things, otherwise you could waste a lot of money. I make it a habit of checking my ROI at least once a month. As you gather enough data about your sales, you’ll notice that certain products sell well on certain CSEs and other products perform lousy. If you see product clicks that simply aren’t selling, it’s in your best interests to remove these products from your data feed altogether. On the flip side, if you notice certain products are selling very well, you may want to increase your click bids in order to expose that product to more traffic and more customers. Often times, figuring out your selling trends takes several months and a lot of trial and error. But you need to stay on top of things and react accordingly. It’s also worth noting that many automated shopping cart data feeds do not allow you to mix and match products from your online store. So if you purposely want to exclude certain items, you may have to edit the code that generates your product feed directly. In general, it pays to understand how your feed is generated so you can make edits if needed. After all, every comparison shopping engine has its own feed format and may require slight modifications to your feed generator. Finally, be wary of CSEs that have affiliate programs for blogs and other publishers. Often times, if your product ads end up on a blog, the conversion rate will be much lower. In fact, I would be extremely careful when signing up for any CSE that runs a publisher affiliate program as most CSEs won’t let you turn this “feature” off. I’ve been using comparison shopping engines to market my online store for many years now and today I’m going to share my experiences with you. IMO, there are way too many “general” articles out there that don’t give a good picture of what it’s like to actually use a CSE from the perspective of a small business owner. So today, I’m going to provide you with my personal review of Google Shopping, Bing Shopping, Shopping.com and Nextag based on real data from my own shop. Editor’s Note: The comparison shopping landscape has changed drastically in the past several years. This article will be updated frequently as new developments occur. My data for this post was taken from December 2017. Also, the results that I’m presenting are very specific to my online wedding linens store and should not be taken as fact. Every store may achieve different results depending on what they sell and the results I’m reporting here should be taken with a grain of salt. Google Shopping was the very first CSE that I ever tried and I started using them back when it was a free service called Froogle. Google Shopping is easily the best CSE in terms of click volume and customer reach. The best thing about Google Shopping is that almost every single shopping cart supports the Google feed format out of the box so you have to do very little work in order to submit your products online. And even if you screw up your product feed, there’s a nifty feed testing tool which gives you instant feedback in case you have errors with your submission. 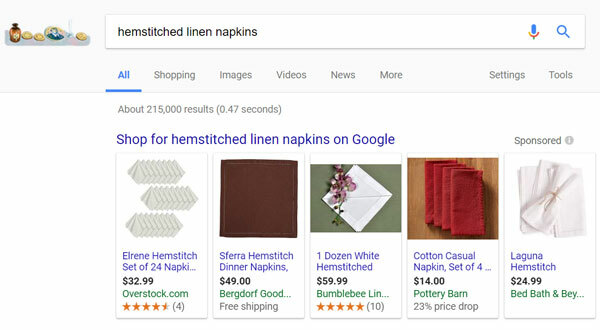 As a result, getting your products uploaded to Google Shopping is a snap and extremely easy to do. Once you have everything setup, your products will start showing up in the search results and on various shopping sites. You can also implement other nifty features like dynamic product level retargeting and all functionality is nicely integrated into Google’s Adwords interface. My conversion rate for Google Shopping was easily the best out of all the CSEs I’ve used. Right now, I’m getting between a 5-7X return on ad spend. Here’s a snapshot of my campaigns (Dec 2017). In addition to the high conversion rate, Google Shopping produces the highest volume of conversions compared to all of the other CSEs reviewed in this post by a significant margin. If you decide to use any of the CSEs, Google Shopping should be your top choice. Note: There are many ways to optimize and refine your Google Shopping campaigns which I cover in my online course but I will also be publishing a more in depth blog post shortly. Stay tuned! 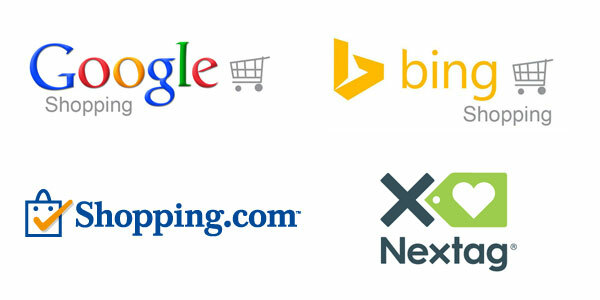 If you are getting good results with Google Shopping, then it’s a no brainer to try Bing Shopping. Even though Bing search only has 20%+ market share, it actually converts quite well and can be cheaper than Google. When I first started using Bing, I saw immediate results. And here’s what’s funny about Bing. It is basically a clone of Google Shopping. In fact, Bing lets you import all of your Google campaigns at the click of a mouse. It takes 5 minutes! As you can see, I’m getting a 6.59X return on ad spend which is pretty good! The upshot is that Bing is a great way to generate some additional sales at a very high ROI. But don’t expect a large volume of sales as Bing is significantly smaller than Google in terms of market share. Note: Take these numbers with a grain of salt as there are many variables at play. For example, if I were to set my bids 18.5% higher, I’d probably get more conversions at the expense of ROI. Your mileage will vary. In most of the comparison shopping reviews that I’ve read online, Nextag falls into the top 3 or 4. And prior to 2017, I was running Nextag pretty religiously and getting decent results (more details on this in a bit). In terms of implementation, the merchant interface is fairly intuitive and I didn’t have any problems navigating and setting up my product feed. However because Nextag has its own unique feed format and does not accept Google’s feed, I had to setup my own feed from complete scratch. In the grand scheme of things, this isn’t that big of a deal but it did take me about an hour to get everything correct. Ideally, even if a CSE does accept Google’s product feed format, you should always generate your own targeted product feed so your products get listed in the proper categories. For example, most CSE’s have their own distinct product taxonomy which may not necessarily translate correctly across different shopping platforms. When I first started using Nextag back in 2013, I listed every single one of my products online with minimum bids and these were the results I got out of the box. Not only did Nextag perform much worse than Google Shopping, Bing and pretty much all the other CSEs I tried but I didn’t even make a profit on the listings. The other thing that I noticed was that the minimum CPCs for Nextag were much higher than the other CSEs I reviewed. Anyway, I took a closer look at my analytics data for Nextag and something immediately jumped out at me. It turns out that there were several categories of products that I listed that received clicks but zero sales. As you can see from the numbers above, the conversion rates and ROI were much better once I stopped listing the non-sellers. This just goes to show that certain CSEs cater to certain classes of products and that you really need to use your data to determine whether the ROI is worth it. I ran Nextag ads profitably until 2016 when I ran into some major issues with click fraud. All of sudden I was getting a flood of clicks out of nowhere that were not converting after being really happy with the platform in the past. When I tried to debug the problem, I discovered that bots were randomly clicking on links and I was getting charged for them. When I complained to their support, they told me there were no anomalies. Now I could have spent a lot of time collecting more proof and trying to get my money back but ultimately, I opted to stop using them altogether. A while ago, I tried running Nextag ads again, but the conversion numbers haven’t been the same. For historical purposes, here are my lifetime conversion rates with Nextag before they tanked. Shopping.com is also one of those CSE’s that consistently ranks in the top 5. They are owned by Ebay and as a result, their listings can sometimes be seen below Ebay auctions which helps with your products’ visibility. In terms of implementation, the setup and navigation is fairly intuitive and I had no problems getting everything setup properly. Once again, I had to create my own feed from scratch. If your cart doesn’t support a Shopping.com feed out of the box, you’ll need to get someone to code it up. When I first started using Shopping.com in 2013, I listed all of my products with the minimum CPCs and my numbers were fairly decent out of the box. And for several years I was impressed with Shopping.com’s performance. Out of all of the CSEs not named Google and Bing, Shopping.com sent a lot more traffic (Over an order of magnitude more than Nextag). And for the sheer amount of conversions that Shopping.com was sending my way, it was well worth the cost. At its peak, I was getting a 5.1% conversion rate with a ROAS of between 4-5X. But just like with Nextag, something happened in 2016. All of sudden, my traffic surged but my conversions did not. While I was getting 4-5% conversion rates before They all of a sudden tanked to .34%! The amount of clicks from January to June 2016 doubled from the 2015 holiday season. This is not normal. Traffic drastically slows down in the beginning of the year. When I looked deeper into the traffic I was getting, guess what I discovered…more BOTS! When I showed Shopping.com the traffic patterns, they denied all click fraud allegations and recommended that I install their conversion optimizer. 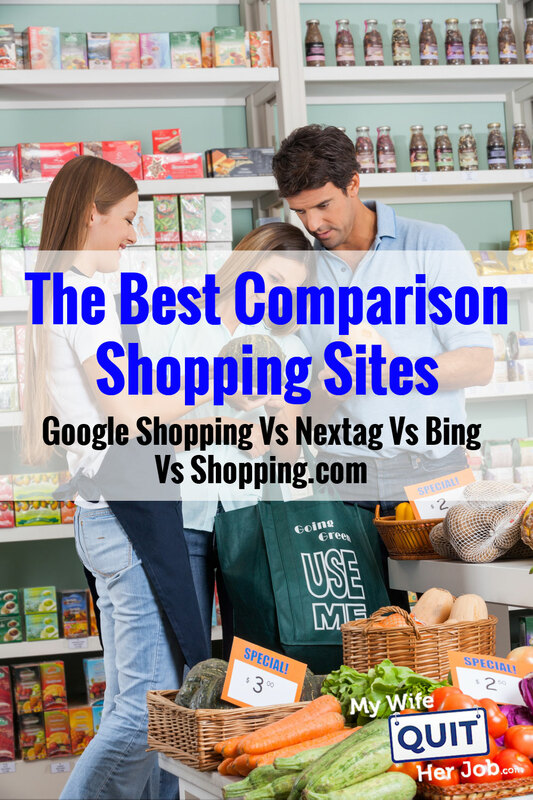 The comparison shopping engines are a great way to increase sales for your online store. Because the conversion rates are so high, you can potentially get a lot of bang for your buck by advertising on these services. Several years ago, I was using The Find, Pronto, Shopzilla, Pricegrabber among others… but the landscape has changed dramatically over the years. Right now, Google and Bing are the only CSE’s that I’m currently using but I’m experimenting with Shopping.com again to see if anything has changed. Bot traffic is a huge problem and right now, I only trust Google and Microsoft to have decent fraud solutions in place. I’ll update this post when I have more data. I don’t have time to read this now but I’m bookmarking it for later when I try this with my shop. Thanks! As always, I enjoy reading your valuable contents. CSEs traffic has a big jump in 2012, it is wise for e-commerce owners to spend time to learn how to leverage these engines and boost the sales. how do u manage all the different data feeds? do u manage yourself or go with a management service? is there any resources that you recommend either way? I wrote little scripts to handle the feeds myself. It’s not that big of a deal. If you want you can pay a company to handle all of that for you for a monthly fee. thx for the quick response. are there any guides on how to write these scripts? im on a shoestring budget. i can’t afford the feed management services. How many shopping engines are you currently using to generate traffic? i always thought about how those cse’s generate money and that i should use them when i decide to open a shop. however your in-depth article provided me with more then i even expected. i didn’t even know about the google url tagging thing. thx. New reader on your blog. Really appreciate all the contents you put in here. Extremely helpful and informative. Thank you! Regarding this article, I was looking at the Google URL Builder and I’m a bit confused about where I should paste that link once it is generated (for my Shopping.com campaign). I talked to a Google Rep and the guy told me to put the link in my store. However, my logic tells me that wouldn’t make any sense since how can I track clicks from Shopping.com if the URL is on my website. Any chance you can clarify about that? Thank you in advance Steve. Keep up the good work. You should use these tagged urls in your shopping.com feed file and definitely not on your own website. Around 20% of e-commerce traffic for all sorts of product categories come from price comparison engines, so they play a key role for e-commerce retailers. Great article. I enjoy and learn so much from each of them. Your comparison articles are so helpful. In your article on email marketing services you did not include Constant Contact and I would appreciate your thoughts and feedback on them. Thank you very much. Steve, your article was perfect but you should try to add some more information also. For example, lead generation, mail marketing, paid campaigns etc. These will be really helpful to us. Thank you. BOT clicks are bad enough, but we just figured out that shopping.com is sending us actual bogus orders . . . lots of them. It makes their analytics look great (which is why we kept using them . . . good return on investment, or so we thought). But when we saw a pattern begin to develop, and looked deeper, we discovered that virtually EVERY order they have sent us for a long, long time has been false. We catch them on the back end through our standard screening process, but never would have believed that virtually ALL of them are being generated by Shopping.com. This is fraud. We are not pleased. Very helpful to the people who are building their own business.